Concealed handgun classes (CHL) are now called license to carry classes (LTC). It’s the same license and it’s the same class, it just has a new name. The reason for the name change is because the license will now allow you to carry a handgun open or concealed with the same license. We make getting your Texas license to carry fun and easy! We welcome new shooters in our LTC class. Our Texas LTC class is 6 hours long total including the range portion. We run a relaxed and stress free classroom and range. We specialize in new shooters. We have a professional classroom and we own a professional and private shooting range. Our private shooting range is the biggest in the Wichita Falls area and it is reserved strictly for our students. 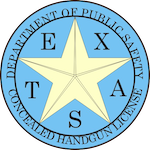 You can also take the Texas license to carry class ONLINE now. If you would like to take the class online, Start here: Online LTC Class. 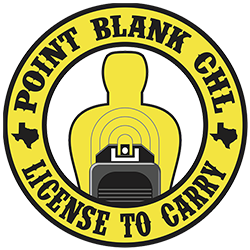 Point Blank CHL is the premier firearms training facility in Wichita Falls, TX. We are a local family owned business that is owned and operated by a husband and wife team of instructors. This is our life, not a side job. We go above and beyond for our students. All of our license to carry classes are taught by Chris and Heather Reitsma. Heather works with the ladies in all of our classes. We also certify people from all over Texas and other States to be firearms instructors. What you will need to bring to class depends on what class you are attending. We have free loaner guns for use in all of our classes if needed. Click on the class you are taking below to see what to bring. State license to carry fees are paid directly to the State and are separate from your class fee. It’s for a 5 year license. You pay your State license fee directly to the State when you are submitting your online application to the State. We recommend NOT doing this until after class so we can go over the process with you.